The Virginia Transportation Construction Alliance (VTCA) honored JMT’s work on the Arch Road widening project in Chesterfield County, VA as a 2018 Transportation Engineering Award recipient (Projects Less than $10 Million, non-VDOT category) at the organization’s Consultant Forum on Oct. 2. 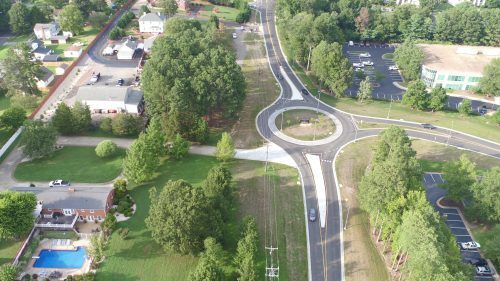 JMT, working with and for Chesterfield County, designed improvements along Arch Road between Midlothian Turnpike and Brundidge Road. Originally envisioned as a traditional widening project, JMT proposed rethinking the project to provide widening along only a short length of the project and replacing the traditional “T” intersection and widening to accommodate turn lanes at the Arboretum Parkway intersection with a single-lane roundabout.